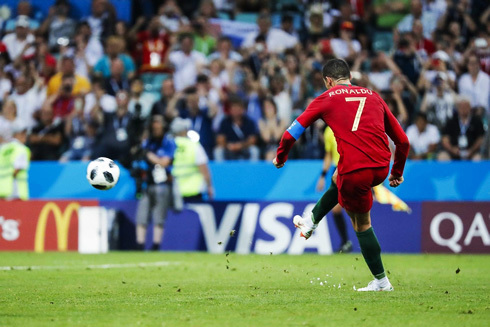 Ronaldo smartly won a penalty kick against Nacho in just the third minute of the match. Admittedly, Ronaldo was already heading down, but he made sure Nacho made contact giving the referee no choice. As always, Ronaldo stepped up and converted the penalty. 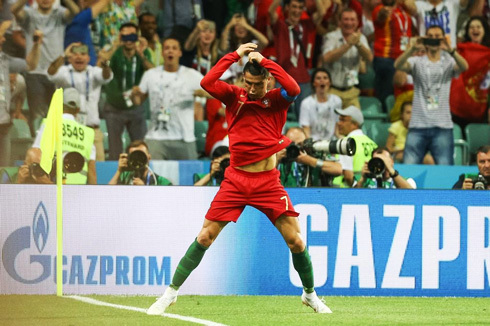 It was 1-0 to Portugal and the game sprung to life. Spain, on the other hand, started to get more involved in the match as time went on. Despite the controversy revolving around the camp with the firing of Julen Lopetegui, the squad seemed to stick together. Isco in particular, was, of course, the leading man as he always is for Spain. And it wouldn't take long before La Roja would be back amongst the goals. It was a brilliant effort from Diego Costa who left on his own chasing a long ball over the top and taking on both Pepe and José Fonte before finishing well past Rui Patricio. All by himself, Costa turned Fonte inside and out before finishing. Less than 25 minutes in and we were heading towards a fantastic match. The game would continue to excite and Spain began to run riot. Isco hit the underside of the crossbar with a fantastic shot and Spain were looking good. But right before the half, Ronaldo would strike again. A bit luckier this time, but a goal all the same. 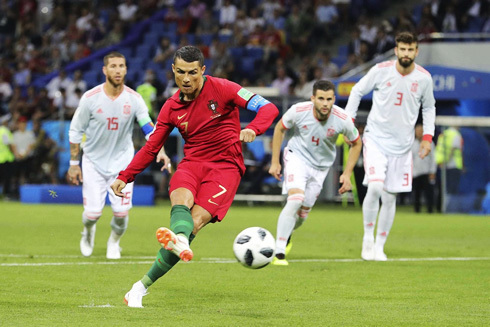 Coming back from an offside position, Ronaldo picked up the ball from Gonçalo Guedes and hit a hard low shot towards the net of David De Gea. Shockingly, the Manchester United keeper bobbled the ball and it squirmed into the back of the net as a jubilant Ronaldo sprinted away. Right after the halftime whistle though, we would be right back where we started. A smartly worked free-kick between David Silva and Koke allowed Sergi Busquets to center the ball for Costa, who bundled home his second right on the goalie. And next Nacho would put in a third. A brilliant volley into the corner of the net off the post. It was his first goal for Spain and a complete redemption from his earlier conceded penalty. Spain continued to push forward and Portugal looked fatigued as they attempted to regain possession. Spain really looked confident and could have even grabbed a fourth as Costa missed inside the box. But Ronaldo would have the last say. Fouled by Piqué outside the box, he stepped up for a free kick in the 86th minute. And by now, you know what happened next... A brilliant shot curled into the top corner. A stunning moment. 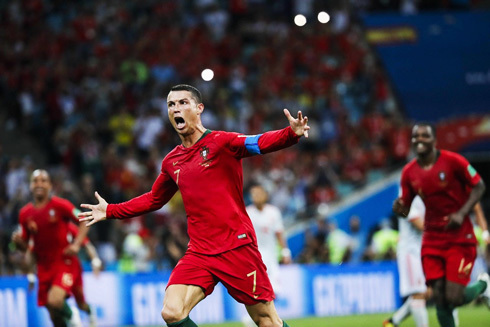 A hat-trick in the World Cup, his first ever and his 51st of his career. Cristiano Ronaldo next game for Portugal is on June 20 of 2018 against Morocco. You can watch Juventus live stream, Portugal vs Morocco, Argentina vs Iceland, Tunisia vs England, France vs Australia, and Croatia vs Nigeria, all matches provided from our live football game pages.